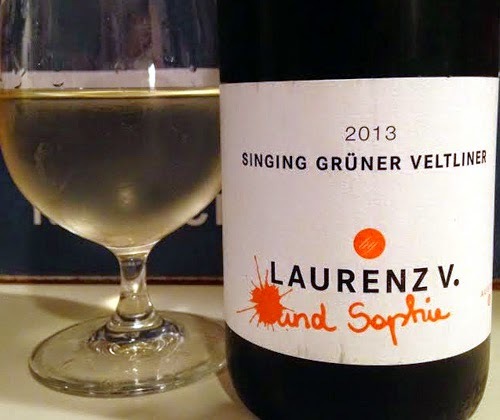 Laurenz Maria Moser V is from a long line of Austrian winemakers and in 2004 he decided to devote his winemaking skills entirely to the native Austrian white grape Grüner Veltliner. He now produces seven different versions, and two of them he collaborates with his daughters. He makes Singing with Sophie. It's mostly from the gravelly soils of the Kremstal region with some addition of grapes from the Weinviertel region. He also makes Sunny with Anna. That's from the Niederösterreich region, which is to the south and has a warmer climate. I don't know why but I'm just in the mood for some classic rock with this review session. So I put on my headphones and immediately I'm hit with Do You Feel Like We Do from Frampton Comes Alive. Whose wine? What wine? When the hell did I die? The package is quite appealing to the eye. It's a dark burgundy bottle with a big white label and orange for a splash (literally) of color. Almost as perfect of a front label design as you can get. On the back label there's a nice, heartwarming picture of Laurenz with his arm around Sophie and a vineyard in the background. I love how the back label balances futuristic font with simplicity. As someone who spent a few years in graphic design, I'm impressed by the work of their label designer. 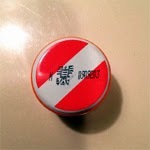 It's a screw cap! Twist! Pour! The color of the wine is a very pale straw yellow. Swirling doesn't leave any legs at all. Peach is the first aroma that greets your nose. There's a specific floral aroma that reminds me of the flower bouquets that come out during the autumn. It even smells a bit like you're raking wet autumn leaves. In a good way, of course. If a Grüner doesn't have white pepper in its profile then it's just not varietally correct. So of course there's white pepper on the nose as well as some other spicy spices. The palate has flavors of lemon, canned pear juice and yellow apple. A few times the taste of watermelon pops its head up and vanishes just as quickly. The finish is hot with white pepper and citrusy with lemon-lime. It's more like the Sierra Mist lemon-lime than Sprite or Mountain Dew. Just an FYI. The finish is also a bit salty. It manages to have a fair amount of acidity but remain pretty soft. It's not crisp or tart or heavy. It's... fluffy. Like a new throw pillow. But one of those comfy throw pillows. Not the ones with the annoying rough fabric that leaves imprints on your forearm. This is such a fun wine! 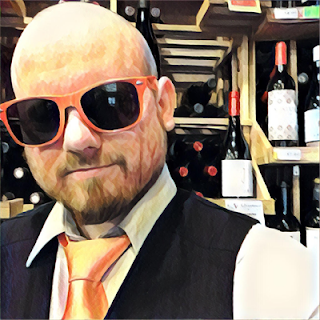 Personally this may have been the funnest review I've done yet just because the wine matched the music I was rocking out to. But the wine balances its fun with sophistication. This is quality juice with a great depth of complexity and sense of pride. If what Laurenz and Sophie were going for was family tradition with new generation infusion they did it to perfection. As a father myself it's inspiring, actually. The next time you plan on having fried chicken, you need to get a bottle of this to go with it. Trust me. There's no better wine and food pairing meant to be with one another than Grüner Veltliner and fried chicken.